This wasn’t Michael Cohen’s first protest. 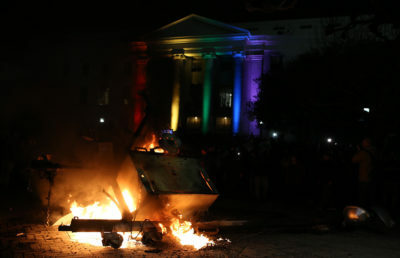 As Cohen, a professor in the campus American studies and African American studies departments, watched his campus in flames Feb. 1, he couldn’t help but notice some striking differences between that evening and the 2011 Occupy Cal protests. Many community members have remarked that UC Police Department took a “hands-off” approach to the protest that erupted on campus Feb. 1 in response to Milo Yiannopoulos’ planned visit. According to UCPD spokesperson Sgt. Sabrina Reich, UCPD officers shot “less-lethal munitions,” including pepper balls and paintballs, to mark individuals for possible later arrest and help control the crowd. 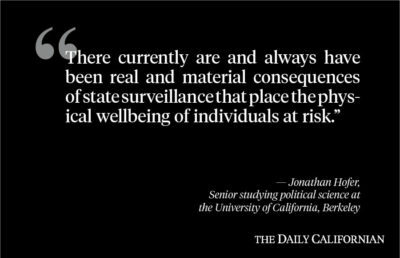 UC Berkeley is deeply rooted in a history of student protests. The Free Speech Movement in 1964, sparked by the administration’s ban of on-campus political activities, was the first high-profile campus protest. 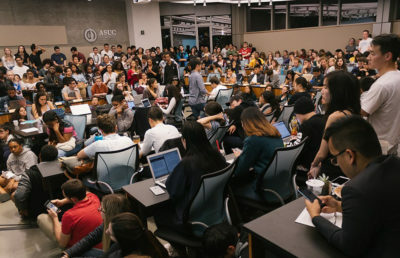 Nearly 800 students were arrested for occupying Sproul Hall on Dec. 2, resulting in the largest mass arrest on an American university campus at the time. Merely a few years after the Free Speech Movement came the People’s Park demonstration May 15, 1969 — commonly referred to as “Bloody Thursday.” According to Reich, the protest was likely primarily handled by UCPD because the property is under UCPD jurisdiction. 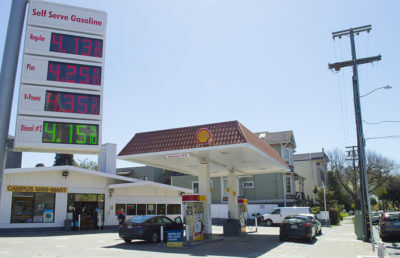 Other agencies, however, including Berkeley Police Department, the Alameda County Sheriff’s Office and the National Guard, aided UCPD in managing the protests. “Bloody Thursday” is infamous for the police’s violent tactics. Officers deployed tear gas and pepper spray, while some were armed with shotguns. About 1,000 people were arrested and more than 100 people were injured, including James Rector, a student who died after being shot by officials. The Occupy Cal protests in 2011, which were in conjunction with the Occupy Wall Street movement in New York City, were largely driven by threats of tuition increases and mandated leaves of absence for staff members. Felarca is the lead plaintiff in a federal lawsuit against UCPD, UC Berkeley and the UC Board of Regents that alleges officers used unprecedented aggressive actions against peaceful protesters. She said she believed that the lawsuit was “very important” for ensuring the rights and safeties of protesters since Occupy Cal. According to Reich, since 2011, all UCPD actions across the UC campuses in crowd control situations directly follow the findings and recommendations of the Robinson-Edley Report. 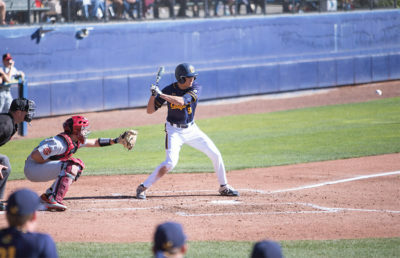 The report was authored by UC officials in response to the controversy surrounding UCPD’s actions during the 2011 Occupy Cal protests. It includes guidelines that campus police must adhere to to best handle protest situations. 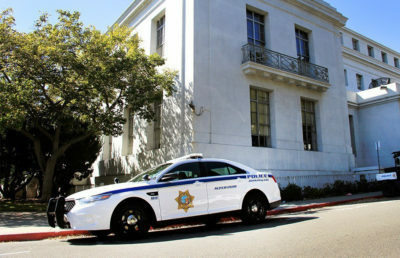 “The UCPD always seeks ways to minimize the possibility of conflict and violence; to maximize student safety and well-being; and to safeguard the right of our community members to engage in peaceful, lawful protests and demonstrations,” Reich said in an email. Campus spokesperson Dan Mogulof explained that the crowd at the Yiannopoulos protest was very mixed — many of the people at the protest were students, while others were unaffiliated “black bloc” agitators, which made UCPD’s decisions difficult. Some “black bloc” protesters, however, have also been confirmed to be students. 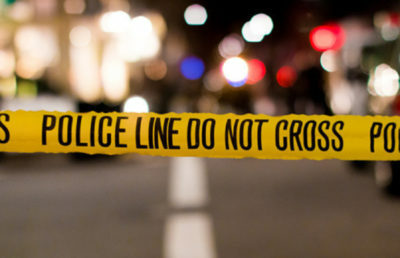 “If police wade into a crowd of that size looking to confront and arrest members of the group that had come with a clear intention of disrupting the event and a demonstrated willingness to adopt unlawful tactics, that would’ve almost certainly resulted in confrontations and conflict that would’ve all been impossible to contain,” Mogulof said. Reich reiterated Mogulof’s sentiments, adding that the presence of the “black bloc anarchists” was unprecedented in the campus’s history. While some criticized UCPD for its lack of aggression at the Yiannopoulos protest, others saw it as a majorly progressive step in police-community relations. 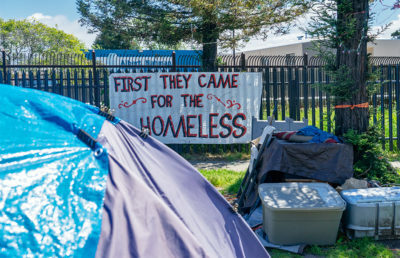 Guy “Mike” Lee, a homeless activist and prominent community protester, said although he has seen a trend of police militarization, he has also observed that police agencies in general are increasingly aware that protesters have become more adaptable to crowd control tactics since movements like Occupy Cal. He added that in his opinion, it is this change that has forced police officers to change their tactics in handling protesters — something he noticed with the Yiannopoulos protest. 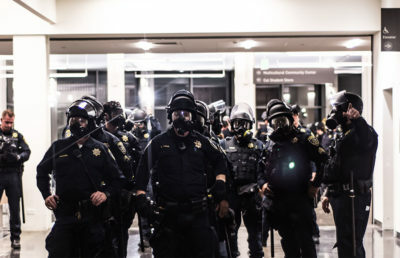 According to Lee, during the Free Speech Movement in the 1960s, police “basically could do anything that they wanted to do.” He said, however, over the years, the criticism for police response has increased, causing officers to rethink their tactics. 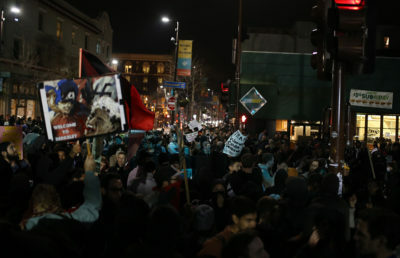 Other members of the Berkeley community attributed UCPD’s restraint to an alleged lack of preparedness for the magnitude of the protest. According to Cohen, UCPD officers were “completely outnumbered” and so were forced to retreat into the Student Union building. He added that he thought to applaud UCPD for not using aggressive tactics was “frightening” because the community should always hold UCPD to a nonviolent standard. 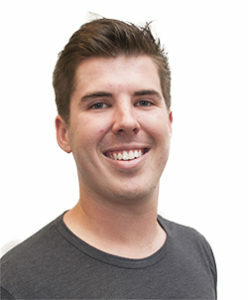 Berkeley College Republicans Treasurer David Craig agreed that UCPD appeared to be unprepared for violent “black bloc” protesters on campus, but he said he believed that UCPD should have taken greater action during the protest. But campus junior Adrian Hernandez, who also attended the Yiannopoulos protest, said UCPD still terrified many student protesters with its riot gear and the projectiles it deployed on the crowd. He also acknowledged, though, that UCPD handled the situation well. Reich and Mogulof acknowledged that some members of the community have criticized UCPD for only making one arrest during the protest, but they both emphasized that the campus’s concern was the students’ overall safety. 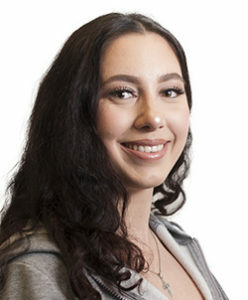 Chantelle Lee is an assistant news editor. 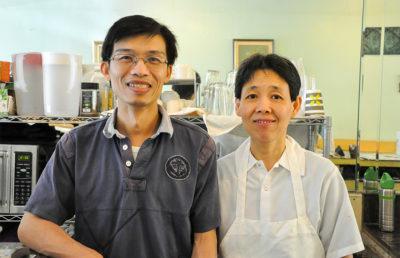 Contact her at [email protected] and follow her on Twitter at @ChantelleHLee. 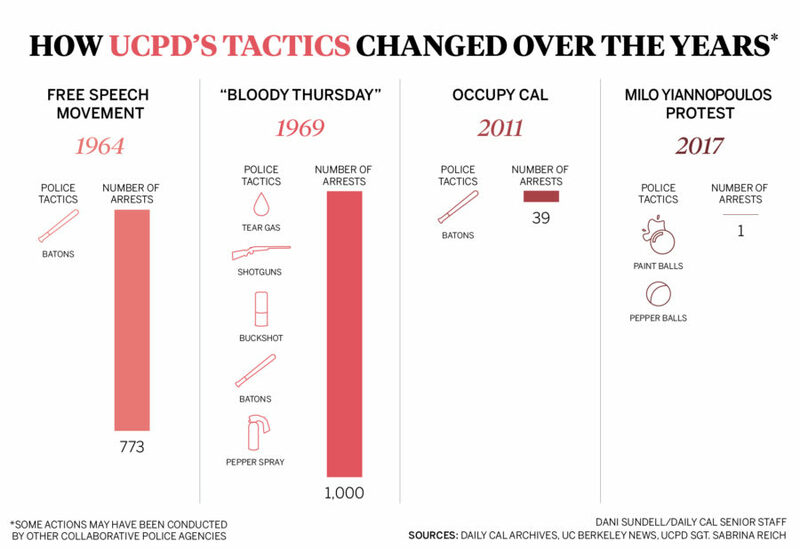 An infographic attached to a previous version of this article may have implied that UCPD deployed tear gas during the Free Speech Movement and used baton strikes during the Milo Yiannopoulos protest. In fact, UCPD officers were armed with tear gas during the Free Speech Movement and armed with batons during the Yiannopoulos protest, but they did not deploy them.